1969: B. A. degree University of California, Santa Barbara. 1972: J. D. degree University of the Pacific, McGeorge School of Law. 1972: Admitted to California State Bar; United States District Court (Eastern); United States Court of Appeal (Ninth Circuit). 1972-1975: Deputy Public Defender, County of Ventura. 1975-1982: Judicial Attorney, Court of Appeal, State of California, Second Appellate District. 1976: Admitted to the Bar, United States Supreme Court. 1982-1983: Private practice, Thousand Oaks, Ventura County. 1983-1986: Judge, Municipal Court, County of Ventura. 1983: Graduate, California Judicial College. 1986: Assigned by Chairperson of Judicial Council to sit as pro tem Justice, Court of Appeal, Second District, Division Six, Ventura. 1986-1990: Judge, Superior Court, County of Ventura. 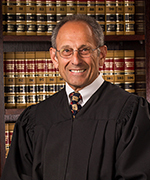 1990-Present: Associate Justice, Court of Appeal, State of California, Second Appellate District, Division Six. 1991: Graduate, Institution of Judicial Administration, New York University School of Law. Penal Code section 12022.5, Circa 1977 L.A. Bar Journal (March 1977). Faretta - The California Experience, Vol. 53, No. 6, Cal. (1978) State Bar Journal.